SuperBot Modular Robot(s) | OhGizmo! The SuperBot modular robotic system is made up of a bunch of identical, independent little robots that can connect to each other in different ways depending on what they’re trying to accomplish. 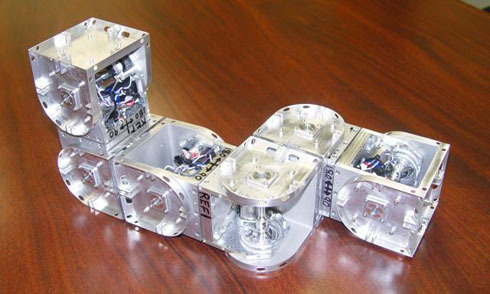 Each bot consists of two cubes connected by a hinge, with an onboard power supply, servos, sensors, a microcomputer, and six connecting faces to attach to other bots. When connected, all of the bot modules coordinate their movements depending on how many modules there are, how they’re connected, and where they need to go. If they run into a snag, they can always detach and reconfigure themselves into (effectively) an entirely different robot. SuperBots are obviously still a work in progress (you may have seen a prototype and some computer models on the Discovery Channel (or Science Channel) show Beyond Tomorrow, but the current design stage (reached only last week) is a much better illustration of their long term potential. A whole bunch of videos (all WMVs) of SuperBots climbing, walking, rolling (very cool), caterpillaring, and butterflying are available here, and you can see a video from the bot’s perspective here (direct WMV link). yeah, i saw this a while ago. pretty cool technology. and yes, i found myself rooting for him. WOAH!!! They are so cool. I want them!! With the goal of bringing service robots to help people, PAL Robotics has developed some of the world’s most advanced humanoid robots, the REEM series. With the goal of bringing service robots to help people, PAL Robotics has developed some of the world's most advanced humanoid robots, the REEM series. easy. The entire glance of your web site is great, as well as the content! It has fueled application via smartphones since there is no need to email or fax over bank statements. A payday is a small, short-term loan that is intended to cover a borrower’s expenses until his or her next payday. Fastidious answer b?ck in return of this quer? wit? firm argument? and describing all regarding that. I feel this is one of t?? m?st signif?cant ?nformation for m?. I’m curious to find out what blog platform yoou happen to be using? to find something more safeguarded. Do youu have any suggestions? It iis really a nice and useful piece of information. I’m happy that you just shared this useful informqtion with us. Please keep us up to date like this. Thznk you for sharing. I am really innspired with your writing abilities as smartly as with the layout in ypur weblog. Is this a paid subject matter or did youu customize it yourself? Either way stay uup thhe excellent quality writing, it’s uncommon tto look a great blog like thiss one these days..
great , appreciate it for your hard work. You should keep it up forever!